In your Office 365 add-in settings, you can configure your default options for the add-in, including switching your connected account, setting your default log and track settings, and managing your email integration settings. Please note: if you are using the Outlook desktop add-in, the add-in settings will look different in your mail client. Learn more about how to customize your Outlook desktop add-in settings. In the main ribbon in your Outlook desktop account on a PC or Mac, click Sales Tools. In the right pane, click Settings. 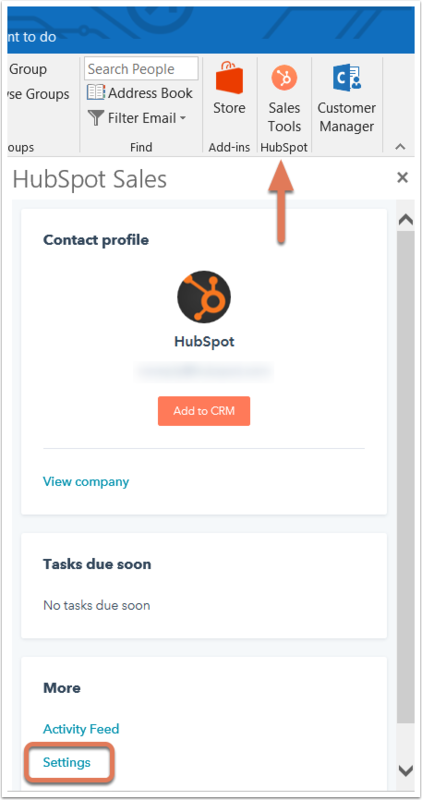 In your Outlook on the web account or Outlook.com account, compose a new email and click the HubSpot sprocket icon sprocket in the bottom right corner of your email composition window. In the right sidebar menu, click Settings. Your inbox is connected: this confirms if the Outlook inbox you're logged into is connected to HubSpot. If your inbox is not connected, you'll see a button to Enable connection instead. Switch connected HubSpot account: if you're using multiple HubSpot accounts, they'll all be listed here. 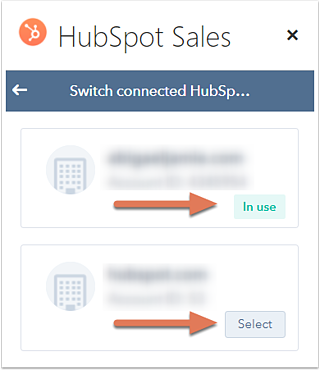 The one marked In use is the one your HubSpot Sales account is currently connected to. This is the account where your tracked and logged email information is stored and where you access sales tools from in your email client. Click Select beside a different account you wish to connect to. Then click Continue and lastly Got it to complete the process of switching connected accounts. 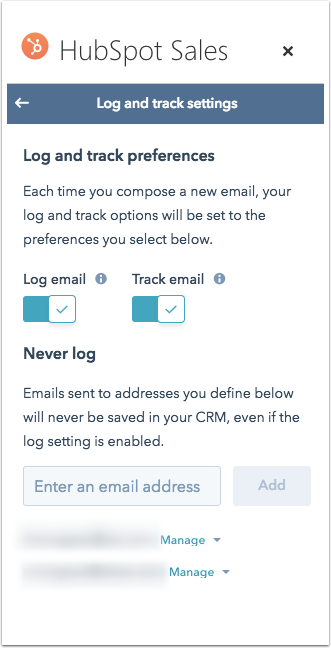 Log and track settings: click to toggle the Log email and Track email switch on if you'd like your emails to be logged and tracked by default. Toggle this off if you don't want your emails to be logged and tracked by default and would rather check the boxes manually before sending each email. In the Never log field, enter email addresses or domains you don't want to log emails for and click Add after adding each. To remove an email address or domain from this list, click Manage > Remove beside the address or domain. Team admins will have the option to Block for all users so other users in the account will not be able to log emails to the specified email address or email domain. You can also specify never log emails and domains from your HubSpot account settings and block specific IP addresses from email tracking in HubSpot. Please note: in addition to configuring your log and track preferences, in order for your emails to successfully log and track, you must click the Sales Tools sprocket icon in the email client to open the sidebar pane. 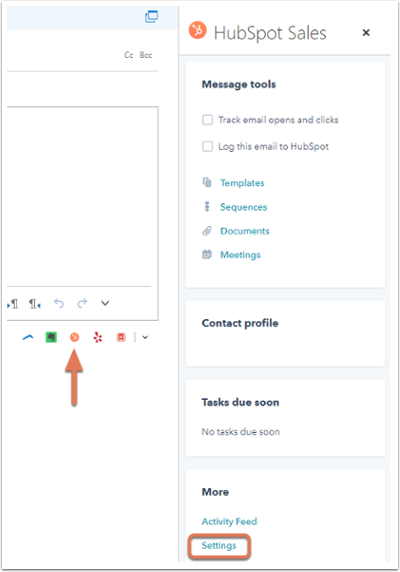 In order for your log and track preferences to apply, the sidebar pane must be open when you send a logged or tracked email. In Outlook on the desktop, this icon is in the ribbon at the top of the email composition window, and in Outlook.com or Outlook on web, the icon is at the bottom right of the email composition window. Email integration settings: manage the settings for your connected inbox. You'll be brought to your HubSpot account's email integration settings. Customer Terms of Service: if you want to learn more about how HubSpot handles your data, click Customer Terms of Service to access information from HubSpot's legal team. Help & troubleshooting: if you want to learn more about the extension or get stuck on something while working with it, click Help & troubleshooting to access articles in the HubSpot Knowledge Base. Sign out: sign out of your HubSpot Sales account from Outlook. You'll be logged out and redirected to the app.hubspot.com login screen. Note that in order to use the HubSpot Sales add-in, you must be logged into app.hubspot.com.